A little tortoise has a cosy home in a bin in a quiet park. But he longs for company. Looking up at the night sky he thinks he spots candles – there must be other animals living up there he thinks but how can he get there? Inspired by a discarded space book he goes in search of a space ship and spots what seems to be a rocket on the other side of the park. There follows a long journey across the park, through the sand pit and paddling pool, which feel like a desert and ocean to the little tortoise. He does not find a rocket but instead he finds adventure and friendship not so far away after all. Space Tortoise is a beautifully written picturebook with magical illustrations and an engaging story which you and your child will enjoy sharing and returning to. Read the story aloud pausing to talk about the questions posed in the text and when your child wants to talk about what is happening in the story or the pictures. When your child becomes familiar with the story (after hearing it read aloud a few times) they might like to join in with parts of it, for example the dialogue between the tortoise and the mouse. Children could tell you the story, using the illustrations as a guide. This sort of activity helps children get familiar with stories and how they are structured. You may find they tell the story using some of the same words as the author or they may tell it using their own words. Share favourite pages and talk about them. Are there particular lines or illustrations you each like? Why does tortoise think that the clock tower is a space rocket? What must it feel like to be tortoise travelling across the sand pit or paddling pool? What would children like to happen next, ie after this story ends? Collect together some junk eg plastic bottle tops and straws and make an improvised space suit together for a small soft toy just like space tortoise. 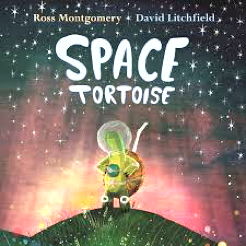 If you have access to a sand pit and paddling pool at home or the local park children could act out tortoise’s journey across the park with a small soft toy in its space suit. You could use a plastic container for an improvised boat. For a longer project, children may be inspired to make a hot air balloon as tortoise does in the story. You could use colourful magazines for the final layer. See here for a how to guide. Your child could draw a map of the park with the places mentioned in the story. They could plot tortoise’s journey across the park from his home to the clock tower. Talk about the map and tortoise’s journey together. Light one or more candles or nightlights, make the room dark and watch the flames move and flicker. Talk about how they look and move. On a dark, clear evening, look up at the sky with your child. Can you see the stars? Find ways to describe them. Can you see any shapes or patterns? See below to find out more about the night sky. Using a candle or yellow wax crayon children could draw small star shapes on thick paper and then paint over with a thin wash of paint or ink. See the stars sparkle as they appear through the paint. Write an invitation to come and visit for tea from the mouse to the tortoise or from tortoise to mouse. Talk about what your child already knows and what would they like to find out. Use these links or information books here, here and here to try to answer their questions. Visit a planetarium for a space show such as this one for London & SE based families in Greenwich.